Venue DITM Every Tool You Need in One Acoustic Pedal. Venue DI Acoustic Guitar PreampWe created the Venue DI so you can travel light, set up fast and sound incredible anywhere you plug in. 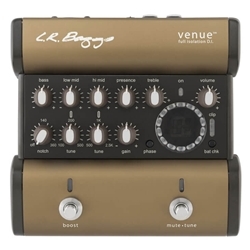 The Venue DI gives you complete control by combining a full-isolation DI output, 5-band EQ with adjustable low & hi-mid bands, variable clean boost and chromatic tuner all in one acoustic pedal. With its all-discrete signal path, hi-graded semiconductors and exclusive use of audiophile grade film capacitors, the Venue DI is on par with the world’s elite preamps and provides a studio quality sound for the stage. Acoustic Guitar Gold Award - Venue DI. FEATURES: Adjustable gain for both passive and active pickups. 5 band EQ with tunable low-mid and high-mid bands. Garret Null notch filter for effective feedback control. Phase inversion for best sound and feedback control. Full chromatic tuner with footswitch mute/tune function. Adjustable volume boost footswitch. Full isolation audio transformer couple DI. 4 segment clip meter to visually optimize gain setting. 4 segment battery )status gauge. XLR and 1/4" outputs. Series FX loop (separate jacks for send and return). Works with 9V battery or DC adapter (not provided).